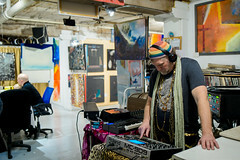 Art, Live Music, Food and Spirits. Jump aboard the FREE Art Ride to check out our west end locations such as Equinox Studios and SANCA (see our map for Art Ride bus stops). 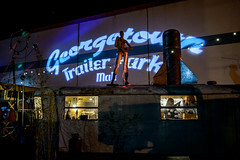 The Georgetown Art Attack rings in the New Year by welcoming a new gallery to our historic neighborhood. Located above Via Tribunali and Hitchcock Deli, Interstitial Gallery’s inaugural show features Seattle artist Cait Willis. Join us on January 10 as we launch another year of lively contemporary visual and performing arts. Eight and Sand hosts the Wood Group Show. This will be the closing reception for Wood. This is an un-themed show where the only requirement is for all pieces to be on a wood substrate. Local and national artists represented are: Maxx Follis, Jasmine Becket-Griffith, Eli Wolff, Ripley, Mary Clymer, Vikram Madan, Rhodora Jacob, Marty Gordon, Gillian LolitaAgogo Alexiel, Jenny Dayton, Craig Van Den Bosch, Ronnie Taylor, Tiffany Toland-Scott, Christopher J Olson, Alexandria Sandlin. Equinox Studios encompasses over 50 Magnificent Makers working in blacksmithing and metal sculpture, glass, and every other imaginable medium. Fantagraphics Bookstore and Gallery features “Black Light: The World of L. B. Cole“ and a workshop with French art collective Le Cigibi. Interstitial is exhibiting Cait Willis, “Dr Jekyll and Madame Hyde”. Cait Willis presents the duality of media and culture thru a series of digital paintings, prints, and video work, allowing the viewer to experience her process of digital miscommunication. Krab Jab Studios hosts “Yvette Endrijautzki Presents: Divine and Sacred”, featuring Yvette Endrijautzki with Drew Tucker,Tokyo Jesus,Joe Vollan and Elijah Evanson.Local assemblage artist Yvette Endrijautzki headlines this exhibition in her first solo show in Seattle, which explores the elements of the human soul as pertains to the world of the Other. Joining her from Japan, Chicago and Seattle are four supporting artists from various disciplines in what promises to be a dark and beautiful journey of the Blessed psyche. January 10th-February 6th, artist reception 6-9PM January 10th with Artist Talk at 7:30PM. Machine House Brewery presents Hallie Scott – Tell a Myth. 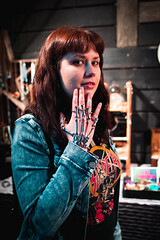 Hallie Scott is a visual and performance artist in Seattle. She has a degree in dance from the University of Washington and works in a range of mediums from dance, to paint, to ink, to film. In the past year she has presented her work at Next Dance Cinema, Strictly Seattle, NEPO 5K, The Artery, Georgetown Carnival, and 12 Minutes Max. The work on display are pieces made within the last two years with found wood, culled from neighborhood construction sites and trash piles. Runway Cafe presents new works by Zach Sell. Zach is a Pennsylvanian artist, currently residing in Seattle with a fond appreciation of breakfast items, tools, underwear, and other objects of his whimsy. 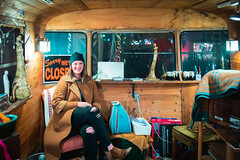 Shannon Koszyk Studios will showcase an array of the lifestyle artist’s many trades including handmade heirloom quality jewelry, vintage military clothing, and unique pieces of art, home decor, and custom strung chandeliers, all of which embody her heavy and dark yet elegant and modern aesthetic. Also featured will be Deanna DiBene Millinery, Mia Fioravanti Clothing, Ozen Company Leather, and vintage clothing from Tyranny & Mutation and Trunk Show Seattle. Spectrum House Salon and Photo presents “PAPERWORK“. Magda Baker Magda will be showing some of her Patterned Objects in addition to her books-hand bound printed collections.Marilyn Frasca Monotypes using a variety of techniques to literally and figuratively draw her characters and environments to the surface of the paper.Rachel Illingworth. Rachel’s print rely on imagery stemming from a response to recurring shapes and patterns in the natural world. Studio E is featuring “Landscapes of Guadalajara” Balo Pulido is a self-taught artist from Guadalajara, Jalisco who approaches his subjects, usually landscapes and human figures, with a feeling of spontaneous and nostalgic yearning. Using a spatula rather than brushwork for the majority of his strokes Balo strikes a balance between figurative representational work and abstraction, leaving part of the subject for the viewer to interpret. The Mix proudly showcases new students from Georgetown’s own Seattle Drum School every month. All ages from 6-8pm.